PRUDHOMME, Sask. -- An explosion and fire at a gas pumping station in Saskatchewan on Saturday prompted an evacuation. 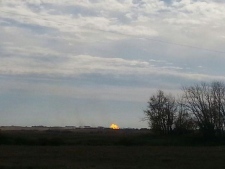 RCMP said the blast occurred at a TransGas facility near this small community, northeast of Saskatoon. Police say there have been no injuries reported. The area around the facility that was being evacuated is just over three kilometres. TransGas is a subsidiary of Crown-owned SaskEnergy, and company spokesman Dave Burdeniuk said several buildings at the site were damaged but there were no employees there when the incident happened. Burdeniuk said automated equipment shut the facility down and vented off any remaining natural gas that was in the pipes, which he said isn't toxic. The fire, however, continues to burn at the wellhead for an underground storage cavern. "I don't know what kind of resources at this point we're going to mobilize yet to get the fire out. Right now, we need to keep any flames from spreading and that's what we're doing with the first-responders that are on-scene with us at this point," Burdeniuk said. RCMP couldn't immediately say how many people were affected by the evacuation, but said it's a rural area and that no major highways or roads are affected. They say they've barricaded roads leading to the site to keep people away. 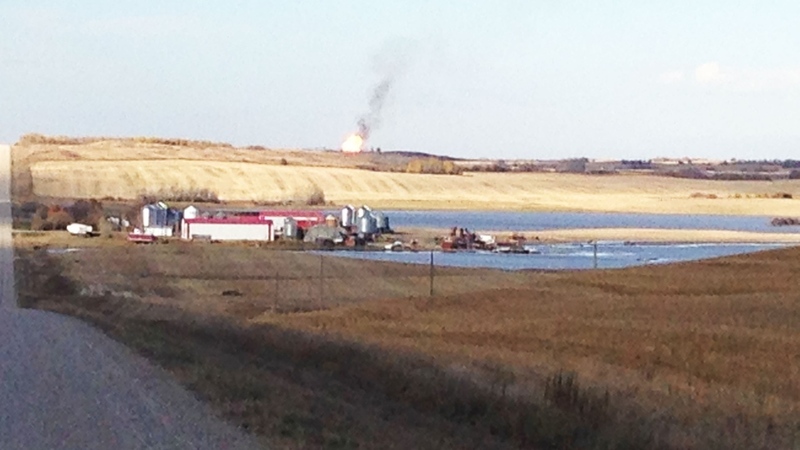 Burdeniuk said it appears the flames were sparked when there was a release of gas at the wellhead from one of seven underground caverns at the site. The caverns, he explained, are used to store natural gas for the winter when demand for heating is greater. The caverns are about a kilometre-and-a-half down and are carved with water in underground salt deposits. Each cavern is about as tall as a 12-storey office building. Burdeniuk was unsure about whether there was a risk of the gas igniting underground. "We don't know what might happen but it should just burn at the wellhead. That's usually how these things happen when they do occur," he said. Burdeniuk said the facility would normally be staffed during a weekday, but was designed to be automated on evenings and weekends when demand for natural gas is low. When extremely low temperatures occur, however, he said a staff member sleeps at the site to make sure everything goes smoothly. "We work very hard on maintenance at these facilities and they are designed to operate in all conditions in Saskatchewan. 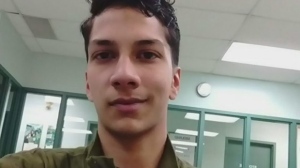 It's too early to say what happened and how this occurred," he said. "We've been operating these facilities since the mid-1960s and have never had a serious injury out at a facility. And incidents like this are rare." No customers have lost service, he said. 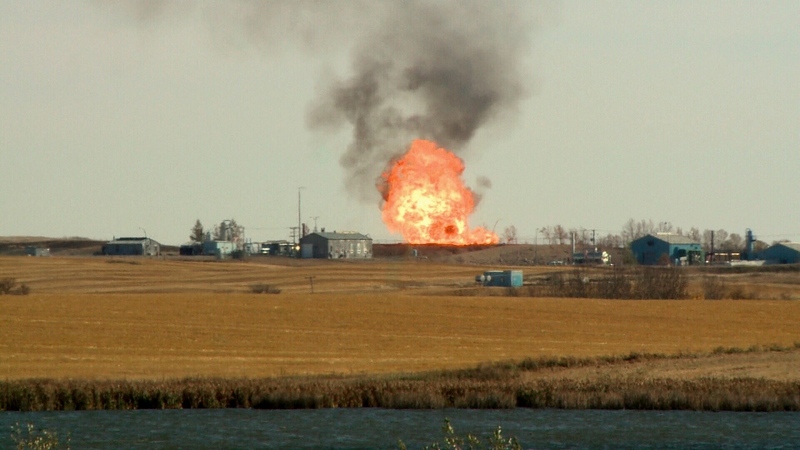 The fire at a Saskatchewan gas facility can be seen raging, emergency crews have ordered a 3km radius evacuation following an explosion that sparked the blaze. Oct. 11, 2014. A fire at a Saskatchewan gas facility has prompted an evacuation on Saturday, Oct. 11, 2014.